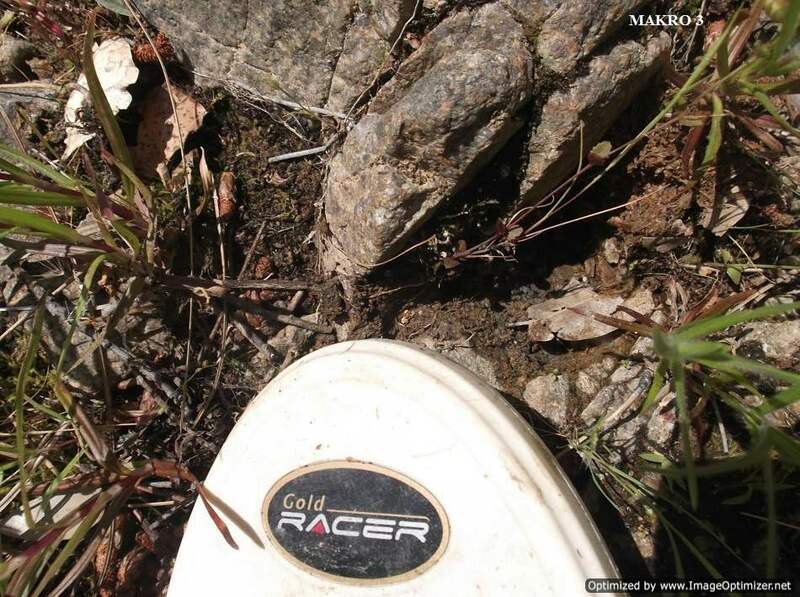 Hello all, here are some pictures of the Makro Gold Racer in the field. The Racer was used in areas previously detected with other VLF's. My detecting partner Chris was using the Racer and I as following up with another VLF going over the same targets. Many of the same targets could be heard easily by both units, however there were a bit less than a quarter of the targets that only the Racer heard very well. 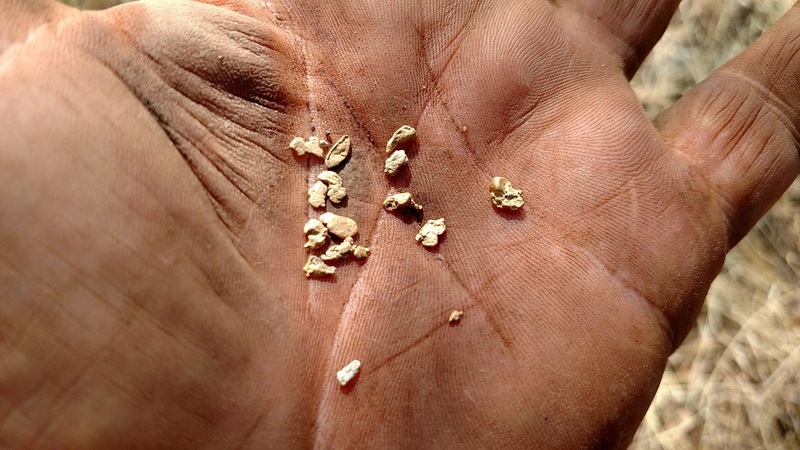 The targets that were in some of the deeper and grittier soil gave a weaker response. Both VLF's read the target but the as I said the Racer sound was much more distinct and in fact heard some an inch or two deeper. The ICMJ featured an article that I wrote titled "Piles of Gold'' just a few issues back. If you look very closely at the first picture you will see the Makro Gold Racer in action. That particular pay pile that we were working had been gone over with other VLF's and a few pieces were heard in the highly mineralized material of the heap. We assumed that was all we were going to get until we went back another day with the Gold Racer. Once we found other pieces we started taking the pile apart. 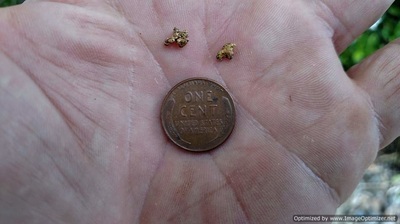 We pulled a bit over an ounce of gold off that pile and have since found other piles. The video shows how many targets we were hearing sweeping the Gold Racer over the ground. As mentioned earlier, some of the targets could have been heard by other VLF's but the Gold Racer was ultimately what made us decide to tear into the pile. Chris did have a bit of luck with the Racer one day along a creek where the alluvial gravels had been worked. That piece was 14.8 pennyweight. One thing that really impressed me about the Gold Racer was its ability to give a better target response to some nice pieces that were on edge in the bedrock. Most of you know that flatter pieces of gold, especially lying flat, will give a better target response than round, marble type gold targets. The Racer showed me no difference in discerning round to flat and I like that. The unit is very light and maneuverable and I like that. Anyone who has detected with me knows my favorite saying "what brush?" and "that's not thick". It can be short shafted or long shafted so it works in the brush for me very well. ​As mentioned in an earlier post, I will let Steve do the technical assessment as he is much better at that than I am. I know that the unit is well built and many changes were put into the final product. I will be using it quite a bit. 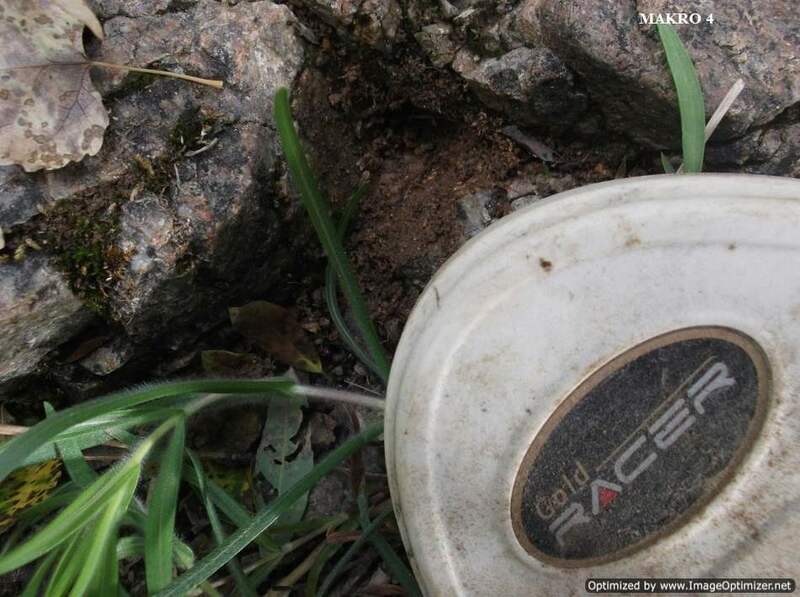 ​The Makro Gold Racer has been one of my most anticipated new VLF metal detectors in years. This completely new model represents something I have wanted for a very long time – a high frequency VLF metal detector that does not skimp for features, in particular as regards discrimination options. A little background. First, I have been testing prototypes of the Makro Gold Racer, and this review is based on those prototypes. The final version due soon has a completely new LCD display layout, audio boost, refinements to other settings, and physical refinements like a change in the handle angle, etc. That being the case this review should be considered preliminary and final specifications are subject to change, as well as details you may see in my photos regarding the physical design of the detector. Second, what is the intended market for the Makro Gold Racer? 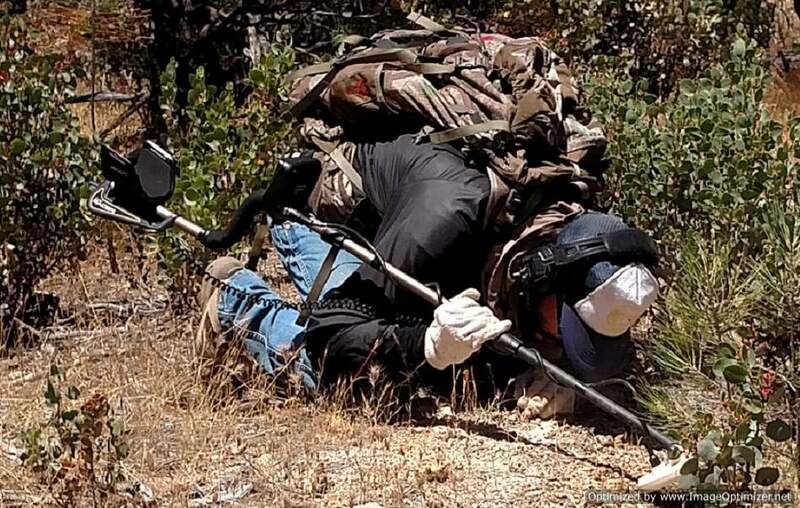 The machine looks deceptively like many other detectors aimed at general purpose metal detecting. 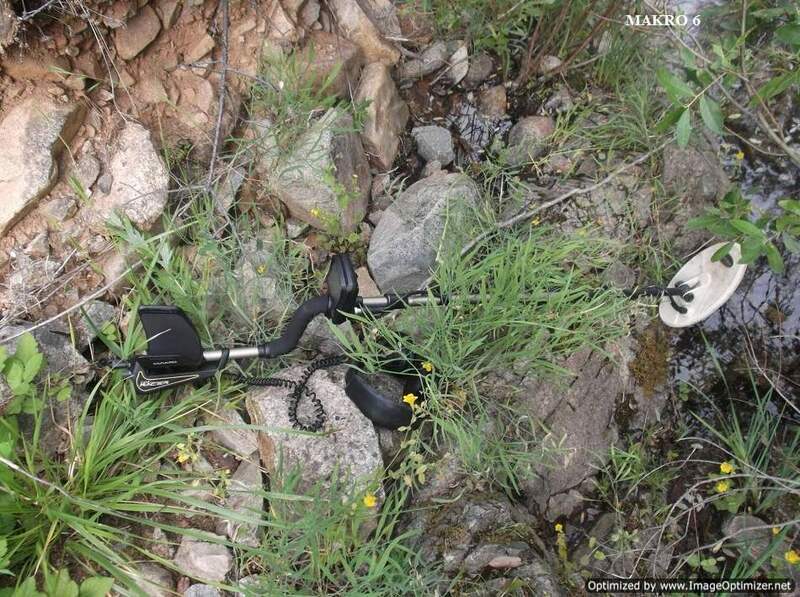 I want to emphasize that first and foremost this is a gold prospecting detector. There are only a few other detectors that directly compare to the Gold Racer which is running at a very high frequency of 56 kHz. Comparable detectors would be the White’s GMT at 48 kHz, the Minelab Eureka Gold running in its 60 kHz setting, and the Fisher Gold Bug 2 at 71 kHz. The intent with very high frequency detectors is to sharpen the response on extremely small metal targets. 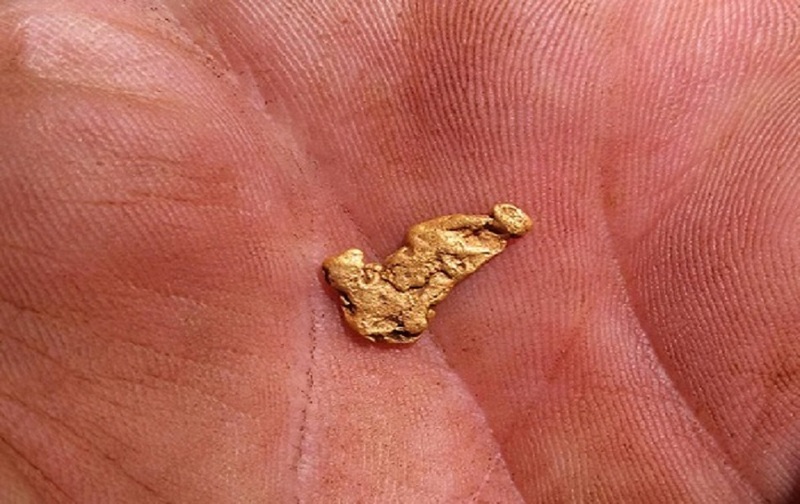 High frequency detectors are in a niche all their own when it comes to finding the tiniest of gold nuggets. This sensitivity does come at a cost however, in that the detectors are also responsive to ground mineralization and hot rocks that less sensitive, lower frequency detectors might ignore completely. There is no free lunch in detecting, and I want to caution anyone thinking that the Makro Gold Racer is going to be a magical solution to all their detecting desires to be realistic about things. Inevitably when new detectors come out people fall victim to wishful thinking, and I would like to try and avoid that here. When it comes to reviewing detectors I do the best I can to describe detectors to help people decide if they might be interested in them or not. Do realize again however that this review is based on preliminary information. Also, I honestly do not want people buying new metal detectors based solely on my reviews. There will be some of who want the latest and greatest right now, and I appreciate that, but being a first adopter does have its risks. My normal advice to people is to never buy anything based on a single review, but to wait for more of a consensus opinion to emerge. 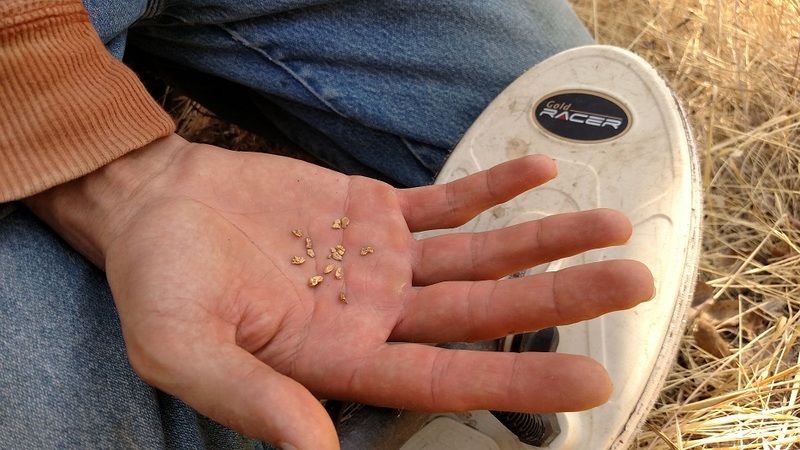 I have used the Gold Racer in the field, and I have found gold with it. 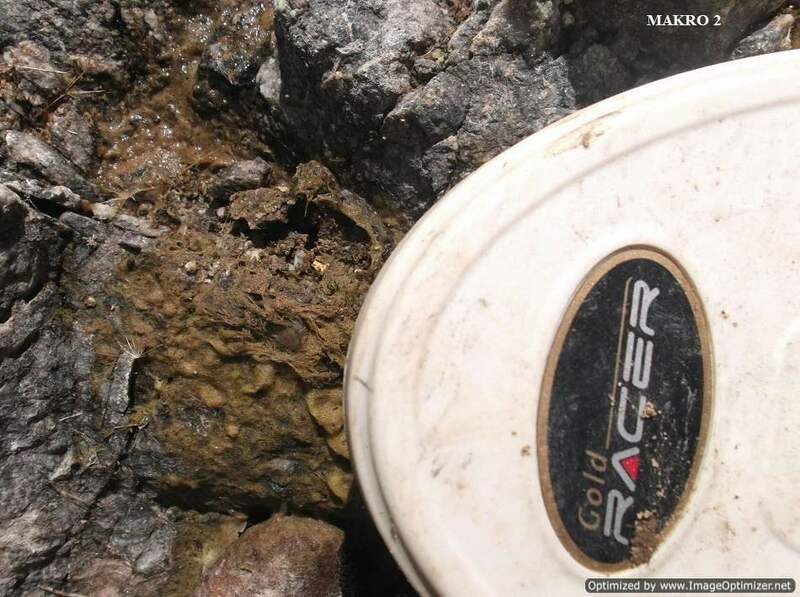 Right now though if it is just a matter of you wanting to know if the Makro Gold Racer can find gold then I refer you to the excellent field review with photos posted by Ray Mills at the Detector Prospector Forum. In outward appearance the Makro Gold Racer resembles its immediate predecessor, the Makro Racer, but this really is a new detector, not just a Racer running at a higher frequency. Feedback on the original Racer has been incorporated as well as extensive testing and commentary from prospectors around the world. Besides the obvious color difference, major physical changes include completely redesigning the layout of the LCD display to better differentiate what are all metal functions and what are discrimination functions. All metal functions are on the left, and discrimination functions are on the right. I think the new display is more intuitive and better accommodates the extra functions implemented on the Gold Racer. The angle of the bend in the S rod handle grip has been relaxed based on feedback from Racer owners. The vibration mode was eliminated, shaving a tiny amount of weight and freeing up room on the display menu. The Gold Racer with stock 10” x 5.5” DD coil and NiMH batteries installed weighs in on my postal scales at exactly three pounds. Coils available at launch are the 10” x 5.5” DD that is stock on the detector. Optional coils include a 10” x 5.5” concentric coil, the highly regarded 5” x 4.5” DD coil, and a light weight 15.5” x 13” DD coil. Let’s take a look at the functions. Under All Metal on the left side of the meter are the functions that apply only to the All Metal mode. On the right are the functions for the two Discrimination modes. The settings are independent in each mode, and once set can be saved when the detector is powered down. This simple and intuitive setup is also part of the power of the Makro Gold Racer. It is incredibly easy once each mode has been customized to flip quickly between the three modes, cross checking target responses to make a dig/no-dig decision. 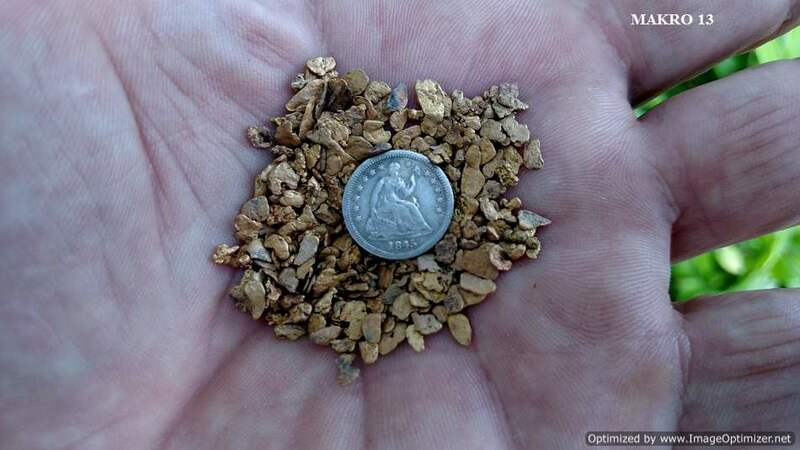 All Metal is the heart and soul of nugget detecting, and the Makro Gold Racer has an extremely powerful, smooth, and sensitive threshold based all metal mode. The Sensitivity setting is familiar to anyone who has used a metal detector, except that there are three base levels of sensitivity or gain. Significant boosts occur between 39 - 40 and again between 69 - 70. Most detectors max out at what is a setting of 69 on the Gold Racer. Settings of 70 and above are a type of hyper gain setting that takes the machine above and beyond, but in extreme ground overload signals may occur. Overload signals are indicated by a “warning siren” audio and the machine is telling you that there is either a large metal object under the coil, or that you are encountering extreme mineralization. In the case of mineralization, either raise the coil slightly while scanning, lower the sensitivity setting, or both. Overloads occurring at 70 will almost always be eliminated by dropping to 69. Rest assured very little is lost by lowering sensitivity to 69 or below, again, because many detectors cannot be set as hot as the Gold Racer even at their maximum setting. Do you ever run detectors and have the distinct feeling some performance has been left on the table, because the detector can always be run at maximum settings? Makro has given you that extra power for where it can be used, but in doing so they expect you will lower settings in places where that extra power works against you. Luckily, the audio alert makes it easy to know when this is. Most people do not know it but many detectors simply shut down and quit working under similar conditions with no indication at all to the operator, a situation referred to as “silent masking”. The threshold setting is the normal control that sets the volume of the slight audio tone that is key to any experienced nugget hunter finding the tiniest or deepest gold nuggets. 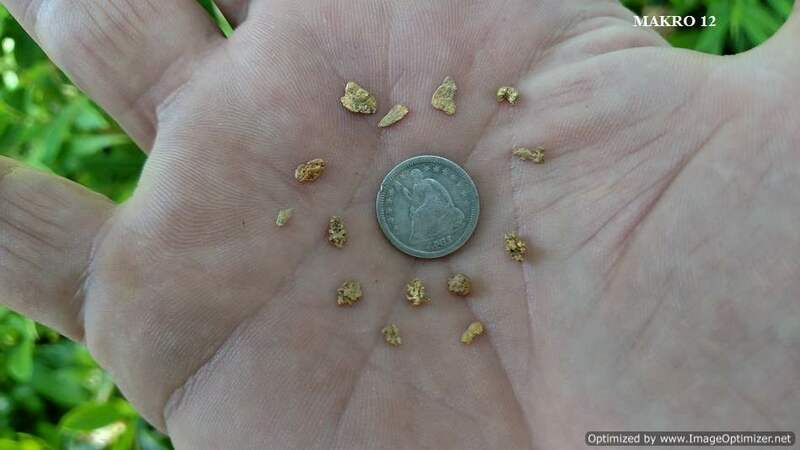 The most minute variations in the threshold tone can indicate a gold nugget, and the ability to read the threshold is what sets most really good nugget hunters apart from everyone else. Makro has added a feature to the Gold Racer called iSAT, for “Intelligent Self Adjusting Threshold”. This setting consists of several levels of adjustment that vary the rate at which the threshold tone steadies itself. Higher levels of iSAT smooth the threshold more aggressively which aids in maintaining a smooth threshold in rapidly varying ground. Lower levels allow for faint variations to be heard more clearly in milder ground for extra depth and sensitivity. The Gold Racer can be ground balanced three ways. Holding the trigger switch under the control pod in the forward position activates an instant automatic ground balance. Just pump the coil over the ground a couple times, release the trigger, and you are done. There is a short delay when you release the trigger, and during this delay you may manually adjust the ground balance setting. The instant ground balance is neutral to slightly negative. Those that like a slightly positive ground balance need only perform the instant balance, then tap the right hand control button three of four times. The Tracking function on the control panel engages and disengages automatic ground tracking. This is most useful where the ground conditions vary wildly, a perfect example being mixed cobble piles or river bars. The tracking is very quick yet resists tracking out genuine gold signals as much as possible. This can also be an aid to anyone new to ground balancing detectors as it makes the process entirely automatic. The Backlight setting adjusts the illumination level of the backlit screen. The FD/Save setting allows adjustments to be saved when the detector is powered off, while the FD function resets Factory Defaults. There is also a Frequency Shift setting to help eliminate outside electrical interference from power lines, or another Gold Racer being operated nearby. This is set through a combination of control buttons but not visible on the menu. Finally, although this is a true threshold based all metal mode, the meter acts independently in discrimination mode at all times and indicates target id information when the signal strength is sufficient to do so. Under the Discrimination menu are settings that are completely separate from the All Metal settings and also saved or reset separately. Disc 1 is a standard two tone mode with low tone ferrous and higher tone non-ferrous. Disc 2 is a similar but deeper, more powerful mode. Quick switching between these two modes, each with fully independent settings, creates a many layered and subtle approach to target discrimination. Both discrimination modes are silent search, no threshold based systems. However, new to Makro models is the ability to set the point at which low tones flip, or “break” over into being higher tones. Typically 39 and lower target id will cause a low tone, and 40 and above a higher tone. This ability somewhat replaces the three tone mode on the original Racer because by increasing the Tone Break setting it is possible to create various coin detecting scenarios. For instance, all targets with an id number below copper penny could register low tone, and therefore copper pennies, dimes, quarters, and dollar coins a higher tone. Conversely, lowering the Tone Break setting would create a more conservative approach for nugget detecting by accepting a little more ferrous digging in return for possibly finding another nugget or two. The Sensitivity control on the Disc menu is the same as but independent of the All Metal setting of the same name. ID Filter is a variable discrimination control, with higher settings eliminating or blanking out id numbers lower than the current setting. This setting is independent for each Disc mode, and again flipping back and forth can create some interesting scenarios for comparing targets at completely different sensitivity and ID Filter levels. This quick mode switching between All Metal, Disc1, and Disc2, all with independent settings, is a very powerful tool once you get used to it. Also new with the Gold Racer is the iMask setting. I noted at the start of this review that all metal detector designs involve making trades of some sort. Extreme high frequency sensitivity to small metal targets does increase chatty false responses in extreme ground when in the discrimination modes. iMask attenuates or suppresses weaker target responses in the discrimination modes and provides a secondary level of adjustment separate from and in addition to the Sensitivity and ID Filter settings. If the detector is producing lots of quick, spurious signals in the discrimination modes, reducing sensitivity or increasing ID Filter settings or both is the first line of attack. If this does not work, go back to the original settings on those functions, and try increasing the iMask setting. If this does not work, again lower sensitivity or increase the ID Filter or both on top of the current iMask setting. iMask acts as a pre-filter giving an extra level of control to help deal with extremely bad ground conditions. Finally, Disc1 is a less aggressive mode than Disc2, so using Disc1 offers even another level of possible options when dealing with bad ground in the discrimination modeThe Backlight setting is independent for the discrimination modes, as is the Factory Default/Save Settings function. I think it goes without saying that there has never been a high frequency metal detector ever produced with this level of options and control. There are a lot of variables to play with here, and I would not be truthful at all if I said I have this machine all figured out. In fact, I think part of the fun with the Makro Gold Racer is we are entering uncharted territory. 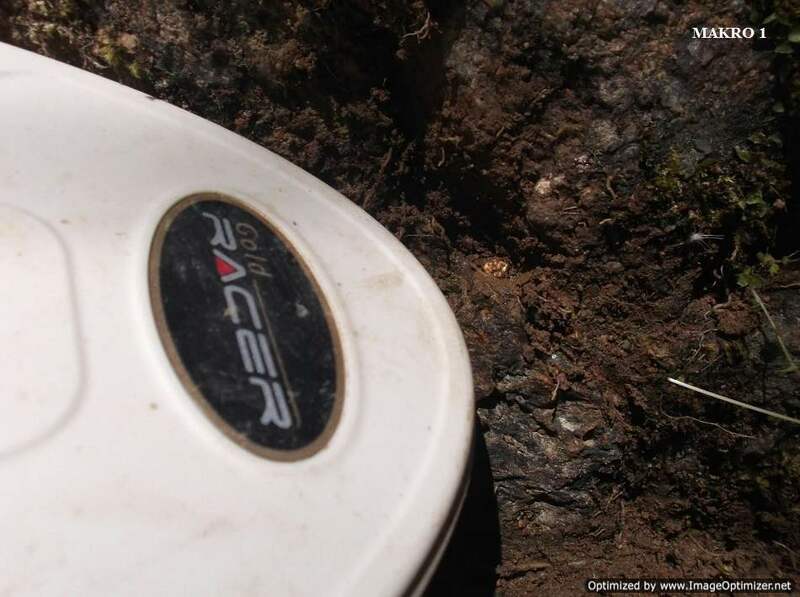 Until the final version of the machine is released, and until quite a few people get their hands on it and experiment, it is very difficult to say just what applications creative detectorists may find for the Gold Racer. It is a very powerful VLF gold prospecting detector, I can vouch for that. 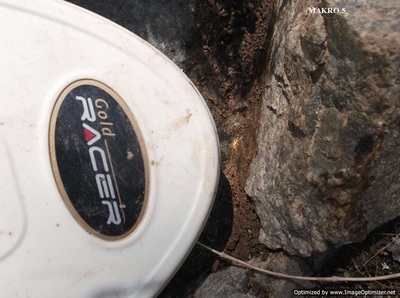 Applications also may be found for jewelry detecting and relic hunting in particular, and even coin detecting, due to the unique combination of features the Makro Gold Racer offers. OK, finally – some notes on real world use! Again, this is all based on prototype models and so I can only speak in generalities for this report. However, there is no doubt in my mind that even the prototype detectors rival anything currently available in a VLF detector for finding tiny gold nuggets. I can easily locate flakes of gold weighing under one tenth grain with the Gold Racer and the stock 10” x 5.5” DD coil. In fact, the machine is so hot with the stock coil I thought using a smaller coil offered minimal if any benefit, mostly because of lost ground coverage and possibly lost depth on larger nuggets. I would only use the smaller coil myself for nooks and crannies where the stock coil can’t fit, but otherwise the stock coil really is the way to go in my opinion. Keep in mind I did say grain not gram. There are 480 grains per Troy ounce and in my opinion I can find flakes all day long with the Gold Racer that weigh less than 1/10th grain, or less than 1/4800th ounce. In trashy locations I generally preferred running in all metal and just checking the meter for ferrous targets, which tend to lock in hard at 21 or 22 on the numbers. In theory anything under 40 is ferrous, but to be safe I might investigate items as low as 35 or even 30 depending on the situation and amount of trash. However, as I noted most ferrous locks in hard around 20 leaving no doubt what the target is. In All Metal mode very tiny or very deep targets beyond discrimination range give no target id at all, automatically meaning they need investigation. The main reason I prefer to always hunt in All metal is the extra depth and sensitivity it affords, and checking targets visually is very quick and more efficient than toggling back and forth to a Disc mode under normal circumstances. For areas with too much trash where meter watching might get to be a bit too much, I jnormally use one of the disc modes set for two tone ferrous/non-ferrous. Iron targets just burp away, while non-ferrous target pop out with a beep. If even that got to be too much for some people, increasing the ID Filter to eliminate most ferrous responses completely can make for a quieter experience in really trashy locations. As always, I must include the warning that the more discrimination applied, the more risk of missing a good target. Use no more discrimination than needed to preserve your sanity! I used the Gold Racer to hunt a couple trashy areas where I just could not go with my big dollar all metal machine, and easily located nuggets in the midst of trash. For me personally the Makro Gold Racer fills in two areas where the high price big gun detectors come up short. The ability to find the tiniest, most dispersed gold possible, both in flake form or enclosed in specimen rock. And the ability to deal with really trashy areas where good discrimination is needed. Perhaps the biggest surprise for me was when I decided to give the 15.5” x 13” DD coil a try. Honestly, I did not expect much from it. You normally do not see a coil this large for high frequency machines because the ground feedback usually overwhelms them, negating any gains that can be had regarding depth. Instead, the Gold Racer seemed to be even better behaved with the larger coil than with the smaller coils. I hunted some cobble piles with it and it ran smooth as can be at higher sensitivity levels. 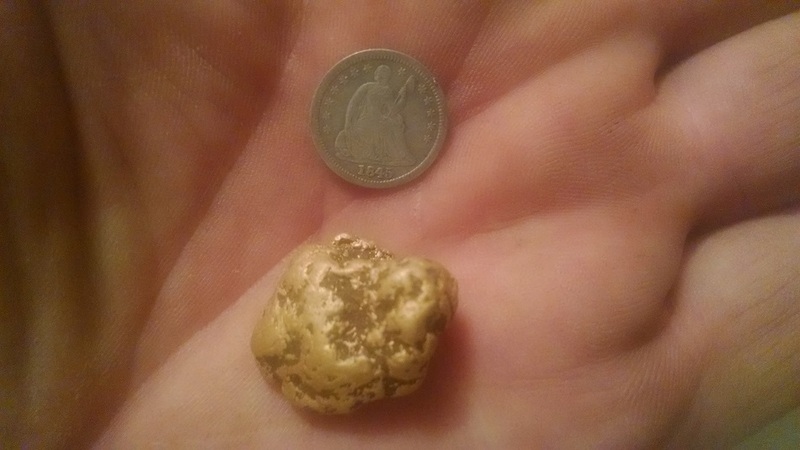 I then wandered into some moderately hot ground with it, still with no problems, and was actually surprised when I came up with a couple small gold nuggets with it. The first was only 0.8 grams which I thought was pretty fantastic. So I put a little more effort into it, and found a 0.3 gram nugget. With a 15.5” x 13” DD coil on a VLF? That is really kind of unheard of, and I was thoroughly impressed. I am not sure what is going on there but I do know the Makro detectors can sense what coil is on the detector. Something different going on with that big coil? I don’t know, but the results and performance surprised me. Also surprising was that for such a large coil it actually was not bad swinging it for half a day. That could be from my using large, heavy detectors all summer however. Still, it was an eye opener all around and changed how I think my Gold Racer might get used in the future. It looks to have more use for covering very large areas blue sky prospecting than I would have imagined. I would be remiss if I did not include at least a note on the versatility possible with the Gold Racer. I recently took it to a local park. Now, my ground in Reno is screaming hot, full of magnetite. The mineral percentage graph on the Gold Racer and similar machines all come up one bar short of maxed, and ground balance numbers run around 88-90. A magnet dropped in this stuff comes up with a lump of magnetite. As a result getting accurate target id numbers with even the best coin detectors past 5” is a chore. I know that sounds crazy but it is the truth. I ran the 5” x 4.5” DD coil and even then had to back the sensitivity down to 69 to prevent overloads in the worst areas. One thing about the Racer detectors that I have heard people complain about, and that is that they tend to up average target numbers in bad soil. For me this is a good thing. Many detectors will see target id number average lower in bad ground, and so fringe targets are more likely to get identified as ferrous when they are in reality non-ferrous. This is obviously not a good thing for nugget detecting. The Racer and the Gold Racer both tend to up average, and so targets like lead sinkers or aluminum that you would expect to give lower numbers often give coin like responses with the Racers. It is odd to see in practice. I got a good high signal reading near 80 at about 5” that when dug up turned out to be a common round lead fishing sinker. Out of the hole the target id promptly dropped to about 45. This effect whether by design or by accident is common with European detectors. I think it is by design because first and foremost these machines are made to pull non-ferrous targets out of ferrous trash. Improperly identifying a non-ferrous item as ferrous is the worst possible result, and so up averaging helps insure that non-ferrous items will not be missed. However, it also means these types of detectors are not as efficient at cherry picking coins as common coin detectors are. You get the coins for sure, but you dig more trash doing it. Still, I experimented a few hours and if you are content to live with the limitation I just described you can actually make some good finds with the Gold Racer under almost any conditions. The ID Filter works very well, and by just running it all the way to 79 it was easy for me to cherry pick a few coins though larger aluminum items like screw caps or big pull tabs often came up in the 80s also. I do think this is a result dependent on ground conditions to some degree, but really the Gold Racer is best suited for people like me who want to recover all non-ferrous targets. I prefer to hunt jewelry rather than coins myself, as one gold ring makes up for a pile of coins. And to hunt jewelry you have to dig aluminum, no two ways about that. The Gold Racer will suit me well hunting jewelry, especially micro jewelry like ear rings and fine chains. This report is very long, and yet I really am just skimming over the features and possibilities inherent in the Makro Gold Racer. I will close by once again noting that while everything regarding the Gold Racer is pretty much set in stone at this point, last second changes are possible. Look for more soon when the factory production models hit the street. I also get frustrated when people want information on new units, but then turn right around and characterize reports trying to provide that information as hype or a sales pitch. I have tried my best here to just present what facts I can without leading anyone to think that the Gold Racer is anything other than what it is. And that, in my opinion, is a very interesting, unique, and capable metal detector. I look forward to hearing for myself in the future what people think about it and the applications and tricks they come up with, because you pretty much need to toss anything you think you know out the door when approaching this machine. Many thanks to the folks at Makro and in particular Dilek Gonulay for providing me with the opportunity to be one of the first to use the Gold Racer. I admit that VLF detectors were beginning to bore me, and the Gold Racer has reignited my interest in seeing what they can do for me.